The Cellu M6 is the key to the Endermologie system developed by LPG Systems. The U.S. Food and Drug Administration has cleared LPG to market the Cellu M6 for the treatment of lymphedema in addition to the reduction of cellulite. Endermologie, the first technology awarded a patent for cellulite reduction, is a non-invasive aesthetic treatment involving mechanical stimulation of cutaneous tissue. Endermologie treatments incite physiological responses including enhanced blood circulation, lipolysis, lymphatic flow and collagen production, all of which play a role in the elimination of undesirable dimples, stretch marks and burn scars. Endermologie has proven an effective means of body contouring and circumferential reduction. During an Endermologie treatment, the practitioner manipulates the surface skin with the patented roll and lift apparatus housed within the treatment head of the Cellu M6. Depending on the operator’s choice of frequency for the vibrating pulse of the lift head, the therapy targets different tissue and produces distinct results. Endermologie is a popular spa treatment and follow-up to liposuction or other methods of lipolysis. 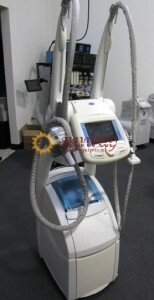 SunrayLaser.com is proud to offer the high quality, non-surgical aesthetic treatment devices developed by LPG Systems. Few devices of any kind in the aesthetic marketplace have developed such an extensive record of accomplishment and become so well recognized. Certified technicians have meticulously reconditioned every Cellu M6 unit offered by SunrayLaser.com. We guarantee that your Cellu M6 will conform to the operating and safety standards of new equipment. We stand behind every sale. Spas, physical therapists and cosmetic physicians have discovered the benefits of offering Endermologie treatments to their clientèle. Let’s discuss how the Cellu M6 can help your practice expand, too. If you contact us via the form below, we will be in touch quickly, ready to provide pricing and any other information you require.